Last week’s announcement of a collaboration in which Dr. J.J. Soares made an agreement with Age Concern to provide free medical examinations for a few elderly per week, who are facing significant challenges because of their financial circumstances; resonates with the ancient wisdom in the above quote by Hillel. That agreement, making available to challenged seniors, over 100 free doctor’s-visits per year; is an example of an act of solidarity. At its best, solidarity strengthens the fabric, holding whole societies together. I offer this qualifier, because like all human qualities, ‘solidarity’ is complex. This complexity offers an opening to a conversation regarding its significance in the society of Bermuda 2016. Homo sapiens have survived around 150,000 years because we are social beings thus relying on each other, but that characteristic remains a work in progress. At its most rudimentary, ‘solidarity’ exists at a clan and tribal level. All societies have been charting a journey for centuries, making progress beyond a fractured perspective to one that is more holistic – a movement beyond the limitations of ‘tribalism’. To quote Marley; ‘fighting against the ‘isms’ and schisms’. Age Concern has facilitated solidarity at its best, for years; masons and carpenters volunteer services to members in need of small jobs – reminiscent of the house-building rallies prevalent in our past. For years, the law firm MJM Limited has partnered with the charity, annually offering free legal advisory sessions. That firm would be carrying forward a tradition that dates back decades involving the provision of pro bono service by community-minded lawyers manning the Free Legal Clinic that has offered weekly service for some 30 years – at the Centre on Angle St.
Dr Soares is demonstrating that community-mindedness, a part of the Island’s shared legacy. Dr. Eustace Cann was a Somerset physician who was active in his community. In the late-‘30’s and early ‘40’s, he played a key role in the development of Sandy’s Secondary School which along with Berkeley was only one of two secondary schools serving black children during much of Segregation. Serving in Parliament he demonstrated that he could move beyond limitations, when he broke ranks with fellow black MCPs and provided key support for the Women’s Voting Rights Act in 1944. His expression of solidarity led him to ‘stand alone’ for that vote and proved useful as he served as ‘’attending physician” during the birthing of the Bermuda Workers’ Association [BWA], later that same year. When the BWA asked Dr Cann to serve as their first president, he declined because of his extensive responsibilities which included the Sandy’s school. Dr E.F. Gordon did take up that baton and his historic service to the Island has been well documented by a number of authors. It is worth noting that Dr. Gordon’s example of generosity helped expand a sense of solidarity throughout the community; campaigning to address segregation, workers’ rights, voting rights, schooling and social services. Out of the BWA, the Bermuda Industrial Union emerged, specifically addressing workers’ rights. Yet another physician took up the baton, moving beyond her ‘vocation’. Dr Barbara Ball sacrificed her Practice to support the labour movement at a critical phase. Details of her courageous role are found in the book “Our Lady of Labour” authored by her colleague Ottiwell Simmons. It is clear that her example proved key in fostering a sense of solidarity; inspiring many of us to walk the walk. The example of solidarity by these three pioneers came at extraordinary times in Bermuda’s history. In 2016 our society is being buffeted by new and uniquely challenging times, Dr. Soares has drawn on the inspiration from many who went before him, to commit to take practical steps to strengthen our social bonds. These stories call for reflection. Ironically, a commitment to an act of solidarity can call for one to ‘stand alone’, which was the case for Dr. Cann in that Parliamentary vote and Dr Ball who was ostracized by many in her ‘tribe’ for her brave stand. An appreciation of the leverage of ‘taking the higher road’ can spark all of us to consider in what ways we can express our solidarity in order to renew former links and fashion new ones. 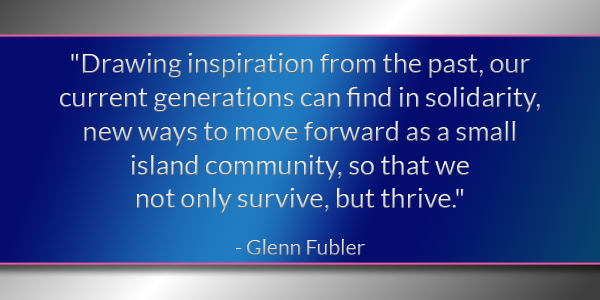 Drawing inspiration from the past, our current generations can find in solidarity, new ways to move forward as a small island community, so that we not only survive, but thrive. Having never met the good Dr. Soares, but heard of his great character and abilities on many occasions, I can only cheer this great man’s acts of kindness and care! ” If you live and think in the past you will never move forward”. Thank you Dr Soares (and the others mentioned and not mentioned) for your pro bono support of those in need.